Gurlfriends ABC producer/writer and Relationship expert Candace Chambers-Belida and Bella Petite Magazine Editor-in-Chief Ann Lauren share their thoughts on love, loss, and life. Bella Petite girlfriends over cappuccino share their personal feelings on love, loss, and life. We debated over whether or not life in the past was better now and was it the past that appeared to have captured our hearts or rather the lessons learned that made us the resilient women we are today. The jury is still out on that one! We shared our exhilarating whirlwind romances, drama driven break-ups, and even moments that only one could remember as quick fleeting rendezvous. What brought tears to our eyes the most was the love lost, whether it was that painful break-up or losing the one you loved to life’s inevitable- death. My girlfriend has endured the pain of losing her husband (and son) both of whom she frantically desperately tried to save one fateful morning. For her, the pain of loss, and love is especially challenging and is a heavy burden on her heart that she carries. With that said, she has a strong belief deeply rooted by trusting in her journey and that in God’s timing she will be blessed with an abundance of love, prosperity, and happiness. What I have come to appreciate about my girlfriend is her authenticity, kindness, compassion for others, she is one of the strongest and inspiring women I know. She is always there for you, a true friend. Unfortunately, both my girlfriend and I have suffered the ultimate loss of losing our soulmates to death. My recollection of the moment when I received the chilling news that my husband David had cancer giving him only two months to live, was like falling off a cliff in slow motion. No matter how you try to be strong, there are occurrences in life that cut you to the core. I remember those days and months after he passed away, where it was easy to pull the sheets over my head and even harder to get out of the bed to face the world without him. As both of our water-teared eyes and choked up emotions stirred us, there was no doubt in our mind that life has a way of throwing you a curve ball when you least expect it. My friend and I discovered that in looking back on some of the hard moments there had to of been an incredible supernatural-Godly force; that seemed to of lifted us up and pulled us out of the abyss of loneliness and pain. Bella Petite on love, loss, and life sorrows. No matter how hard it is to face some of life’s’ problems, one fact remains, crises is an indelible part of life. And sooner or later we all face difficulties that are hard to bear. Just know that you are not alone, at this moment. No matter what you are facing, this is not yours forever. As my girlfriend and I concluded, we are stronger and more sensitive to things, and we have a special appreciation for life, compassion for others, deep loving concern and understanding that is birthed through our pain. After all truly beautiful people do not just happen. We agreed that no matter what curve balls are thrown knocking us down that is virtually a life lesson, and it’s more about how we pick ourselves back up, allowing our hearts to be open to love again, prosper and that in itself is sincerely worth living for. PARTICIPATE IN OUR INITIATIVE SHOW YOUR SUPPORT FOR US! COPY AND PASTE THIS FABULOUS GRAPHIC INTO YOUR FACEBOOK TIMELINE COVER HEADER AND PROMOTE IT ON YOUR WEBPAGES. Join Bella Petite on Fashion, Entertainment, and Lifestyle for Women. “Petite is fit, curvy and plus-sized. 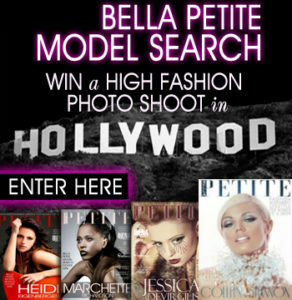 Enter the Bella Petite Model Search. Models may win a photo shoot in California, fashion editorial spread, tearsheets for your portfolio and modeling promotions! Enter the ONLY model search in the world for petite women 5’7″ tall and under! This article is very helpful. Sometimes we all feel so alone with our painful breakups. But reading about how two amazing ladies are dealing with the worse loss ever the death of your husbands and children is unimaginable for me. Miss Ann Lauren a woman I have always admired and just now learning about her personal tragedy has me in shock because of all that she does for us petite women that I’ve followed for years now. Really surprised at how she’s gotten through this terrible loss with such grace and able to empower others. Her authentic selflessness shines here at BellaPetite. Thank you for sharing. P.S. I’d like to know more about Ann Lauren and learn her secrets to her success. I’m certain she would inspire everyone with her story. Having gone through a bad break-up myself, I can relate to what Candice wrote. I love the advice. Keep up the good work. You are inspiring many people around the world to never give up. Candace has the unique gift of expression and her journey inspires everyone she touches! Having been through bad breakups I get it this and how hard it is to feel good about life. Fortunately, I have never suffered the loss of a husband and a child. Candace’s words are heartfelt. My heart goes out to Ann Lauren Bella Petite’s founder it made me feel very sad since I have been a subscriber for a long time and never knew this about her and the pain she lives with. I am very impressed how Miss Lauren is able to create this great magazine as well as inspires great confidence in women helping us to love ourselves. I can only imagine the pain she carries in her heart but yet she smiles, inspires and achieves never showing her pain to us. Thank you Candace for writing this great article! I have been a loyal reader of Bella Petite and a big admirer of Ann Lauren for everything she has accomplished for all of us petite women. She has made me love being petite! Having read this article before now, I never knew she suffered such a huge loss!!! OMG I don’t how she does it all. I want to thank you Ann Lauren for being an amazing lady of true grace and style. Please keep on being you and all that you do! Truly all inspiring! I never knew this about Ann Lauren she has always been inspiring for me and now reading this she is an even more amazing woman! I can not imagine losing the love of my life and a child. Truly so sorry to hear about this. Please accept my condolences. Wow, Miss Ann Lauren’s genuine soul shines brightly here at BellaPetite. I too have suffered a bad breakup with an abusive guy, but never dealt with the death of a loved one, my heart is with you, Ms. Lauren. You are a beacon of hope for all of us. Thank you for sharing.